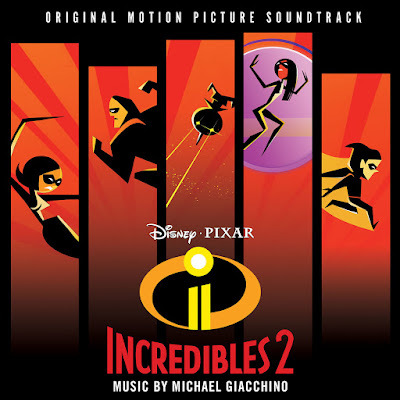 Oscar®-winning composer Michael Giacchino returns to the world of the Incredibles with a new score for Disney•Pixar's "Incredibles 2." The original motion picture soundtrack, with music composed and produced by Giacchino, will be released by Walt Disney Records today. The film opens in U.S. theaters on June 15. Giacchino has credits that feature some of the most popular and acclaimed film projects in recent history, including The Incredibles, Dawn of the Planet of the Apes, Ratatouille, Star Trek, Jurassic World and Rogue One: A Star Wars Story. Giacchino's 2009 score for the Pixar hit Up earned him an Oscar®, a Golden Globe®, the BAFTA, the Broadcast Film Critics' Choice Award and two GRAMMY® Awards. "The Incredibles" has a very special place in Giacchino's heart as it was the composer's first film score. Giacchino and writer/director Brad Bird have collaborated on 5 film scores since 2004. According to Brad Bird, Giacchino is remarkably versatile. "Michael is a musical chameleon," Bird said. "He has many styles at his disposal. In many ways, he is a fellow imaginer or an actor who's playing a part in the movie." Having established the now-familiar musical flavor in "The Incredibles," Giacchino chose not to revisit the first score in order to take a fresh approach. Giacchino said, "Brad and I knew we were going to use the main theme of course, but I still wanted it to have a different vibe while it stayed in the same vein and character." His inspirations for the score included Henry Mancini, John Barry and Hoyt Curtin. In addition to writing themes for Elastigirl and new characters, the composer-turned-songwriter also created end-credit jingles featuring theme songs for Mr. Incredible, Elastigirl and Frozone. The soundtrack features cues from Giacchino's score, plus the jingles. The digital version also features bonus tracks, including versions of the jingles by Disney Music Group's new a cappella group, DCappella, as well as "The Glory Days" from the original soundtrack. 4. "A Matter of Perception"
5. "Diggin' the New Digs"
6. "This Ain't My Super-Suit?" 12. "Searching for a Screenslaver"
17. "A Dash of Reality"
20. "A Bridge Too Parr"
21. "Together Forever and Deavor"
22. "Elastigirl's Got a Plane to Catch"
23. "Looks Like I Picked the Wrong Week to Quit Oxygen"
25. "Out and a Bout"
27. "Here Comes Elastigirl - Elastigirl's Theme"
28. "Chill or Be Chilled - Frozone's Theme"
29. "Pow! Pow! Pow! - Mr. Incredible's Theme"
31. "Chad Tonight Talk Show Theme"
32. "Chad Tonight Newscast Bumper"
Incredibles 2 soundtrack is now available for download and streaming. The CD will be available June 29 and can be pre ordered HERE. For more information on Walt Disney Records' releases, check out Facebook.com/disneymusic, @disneymusic and Instagram.com/disneymusic. In "Incredibles 2," Helen (voice of Holly Hunter) is called on to lead a campaign to bring Supers back, while Bob (voice of Craig T. Nelson) navigates the day-to-day heroics of "normal" life at home with Violet (voice of Sarah Vowell), Dash (voice of Huck Milner) and baby Jack-Jack—whose superpowers are about to be discovered. Their mission is derailed, however, when a new villain emerges with a brilliant and dangerous plot that threatens everything. But the Parrs don't shy away from a challenge, especially with Frozone (voice of Samuel L. Jackson) by their side. That's what makes this family so Incredible. Written and directed by Brad Bird ("Iron Giant," "The Incredibles," "Ratatouille") and produced by John Walker ("The Incredibles," "Tomorrowland") and Nicole Grindle ("Sanjay's Super Team" short, "Toy Story 3" associate producer), Disney•Pixar's "Incredibles 2" busts into theaters on June 15, 2018.